Flat tool fits even the narrowest spaces. Cut out to fit numerous nut and bolt sizes. Here's a wrench that's a favorite among film technicians because it was made to fit sister lugs, but the sizes make this a theatrical and television favorite as well. Three ratchet sizes -- 3/4", 1/2", 3/8" Angled handle prevents banged knuckles. Clip a lanyard to this unusually shaped wrench with this extremely tough marine-grade nylon lanyard ring attached. A measly 2 3/4" long and weighs practically nothing, this mini-wrench has cutouts for all the nuts and bolts on a C-clamp. It's even got a hole for a lanyard so you can wear it around your neck or on your key chain. Carry this and you'll never be caught without a wrench again! Usually shipped in black. Orders of special colors will incur a $20 additional handling charge. Everything you need in the palm of your hand. Maybe you've seen the "Gator Grip" on TV and you wondered if it really works. I can tell you it does! This one socket fits all nuts and bolts from 1/4" to 3/4" and all metric sizes from 9mm to 17mm. And it fits odd shapes like wing nuts and eye bolts too. The trick of the Gator Grip is that the socket is made up of 52 spring loaded steel roller pins that automatically conform to the shape of the nut, bolt or whatever else you want to tighten. And here's the best part: I've combined it with a flexible stubby ratchet and a pouch so that you have an entire lightweight socket set that fits in the palm of your hand and you can carry it on your belt! 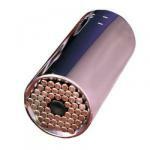 It also comes with an adapter that lets you to use the socket with your electric screwgun. When I show the Gator Grip in person--everybody wants one. This is the coolest tool I've seen in a long time. Yes, you can buy the socket without the pouch or the flexible stubby ratchet. Fits nuts and bolts from 1/4" to 3/4" or 9mm to 17mm. Large socket fits nuts and bolts from 9/16" to 1 1/4". This socket requires a 1/2" drive (not included). 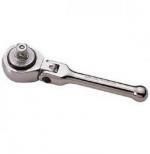 Same ratchet used in the Gator Grip Kit. Special wide jaw opens to size of an 8" crescent. If you're going to carry just one wrench on stage, this is the wrench it should be. 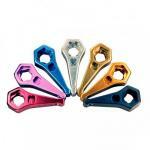 The perfect adjustable wrench for the stage. Small size of a 6" wrench with the capability of an 8" wrench. The extra wide jaw even fits Cheeseboroughs! No need to carry two wrenches. Plastic coated handle provides comfort and protects you from accidental shock. Made by Klein insures high quality. Each wrench is personally tested for smooth operation before it's shipped to you. You get only the best from TOOLS FOR STAGECRAFT. This is a larger version of the 6" Klein Wide Jaw Wrench. Jaw opens to size of a 10" crescent. Why carry an 8" crescent that opens to a 10" size? How many times have you needed to change the bottle on an air lift and the nut was stuck? How long did it take you before someone "found" a wrench that was big enough to handle the nut? Be prepared with a 8" Wide Jaw Klein. Carrying an 8" wrench in your tool bag is lighter than carrying a 10" wrench. 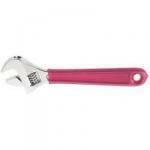 The handle is coated with same plastic coating as the regular dip 6" Klein Wide Jaw wrench. Here's a combination of the equivalent of an 8" crescent wrench and a 3/8" ratchet wrench. The boxed crescent wrench fits nuts and bolts from a 1/4" square (the set-screw on a C-clamp) to a 7/8" hex (the yoke bolt on a C-clamp). It's a huge wrench, machined out of solid aluminum plate. The Mongo-Combo wrench will fasten everything a Mega-Combo Wrench can plus the Light Source Mega-Coupler Nuts and other coupler wing nuts. If that isn't enough, a bottle opener too! 5/16" Hand held T-handle wrench for Roto-Locks. Only 6" long.